Today, on 2nd of October 2017, in Japan starting most wanted ICO. Our editor can't go away. We follow news of project called COMSA from 1st of August. 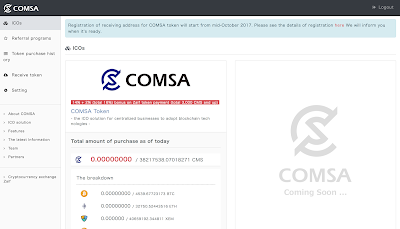 There was Pre Sale of COMSA Tokens but only from $100.000. Now ICO available for all public with investment from $1. Because cryptocurrency is absolutely legal in Japan! Founder Takao Asayama public person and already has 4 working projects! COMSA bring very interesting technology to make ICOs safety and market of cryptocurrencies need this tool so much. We found manual how to invest in COMSA ICO here. Yes, you can invest with Bitcoin, also Ethereum and NEM.